The plain white door is oh so fabulous, don't you think? My husband loooves the white front door and refuses to paint it (part of me thinks he says he likes it so he won't have to paint it), so I'm going to try to sneak in some vinyl house numbers one of these days. 1. My first step was to quickly spray paint the "wreath form" white (one side was already white...I made sure to pick a good one at Costco!) and let it dry. Then I took my ribbon and looped it around the form, making sure it was long enough to hang on my door before securing it to the form with hot glue. 2. 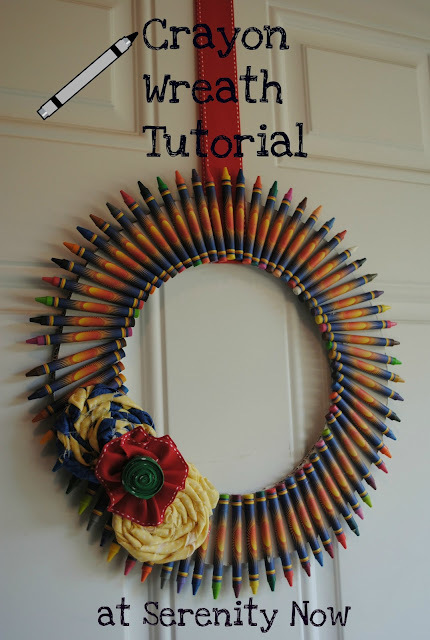 The next step was to hot glue the crayons to the wreath form. I didn't use any patterns for the colors. Just tried to use a nice mix. 3. 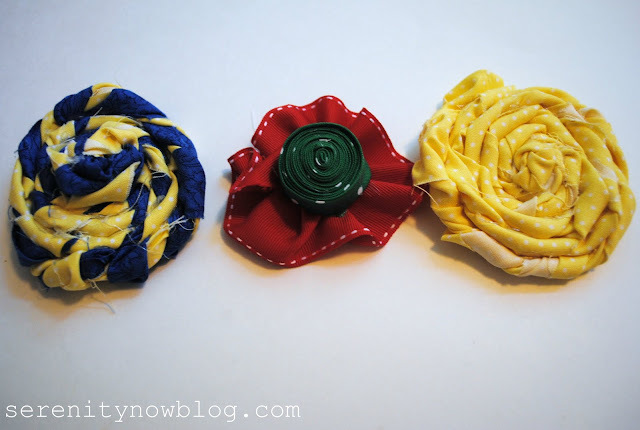 Once the crayons were each adhered, it was time for rosettes! I don't have a tutorial for these, and I tend to wing it, but Jen from Tatertots and Jello has a great fabric rosette tutorial. I hot glued them right on top of the wreath! My girls thought it was one of the coolest things they'd ever seen, although they were slightly disappointed that they didn't get the new crayons. Their little friend Brayden came over to visit and said he liked it because "it's very artistic." thanks for visiting my blog & the sweet comments that you left! i love your wreath, too! 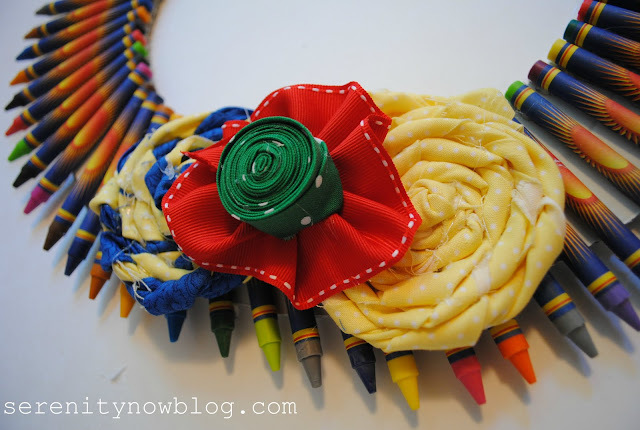 & while i prefer crayola crayons for coloring, i think that the wrappers from your $ tree bargains made a beautiful wreath. Love that you used cardboard for the base. We have crayons out the wazoo here. Love that Staples commercial. Makes me giggle. 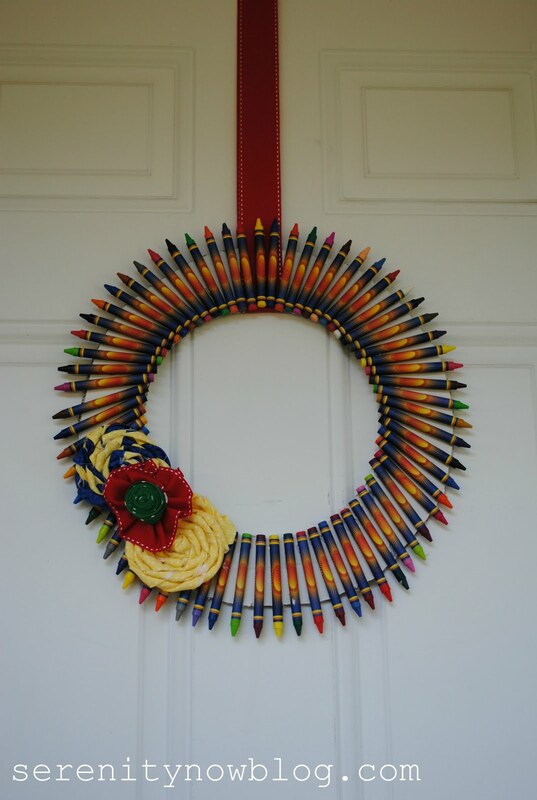 I love your take on the crayon wreath! And I think it looks really nice with the dollar store crayons that all have the same wrapper - it gives it some cohesion and makes it look more "designer". Very fun!!! Love this! Like the same wrapper look, too! i love this idea! 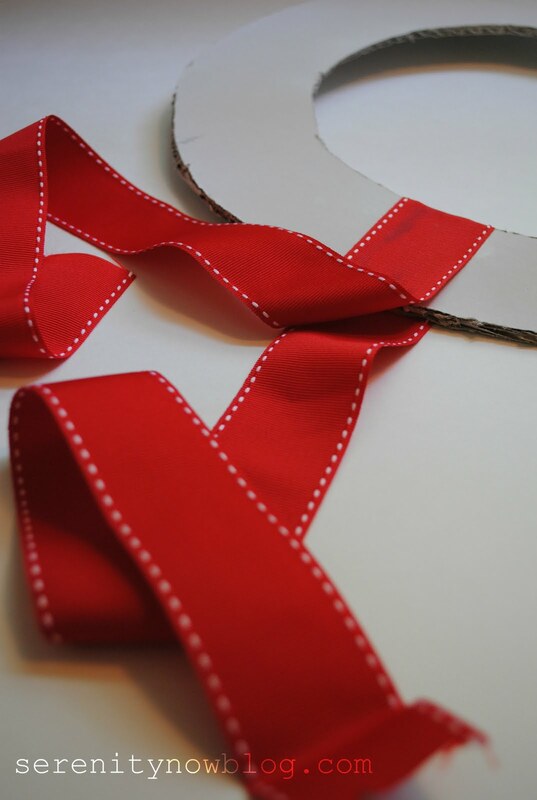 especially the cardboard backing...styrofoam wreaths can be a bit pricey! I am begining a new linky party on Wednesday ~ "Fall" In Love. Please join in on the fun. such a cute way to welcome back to school! 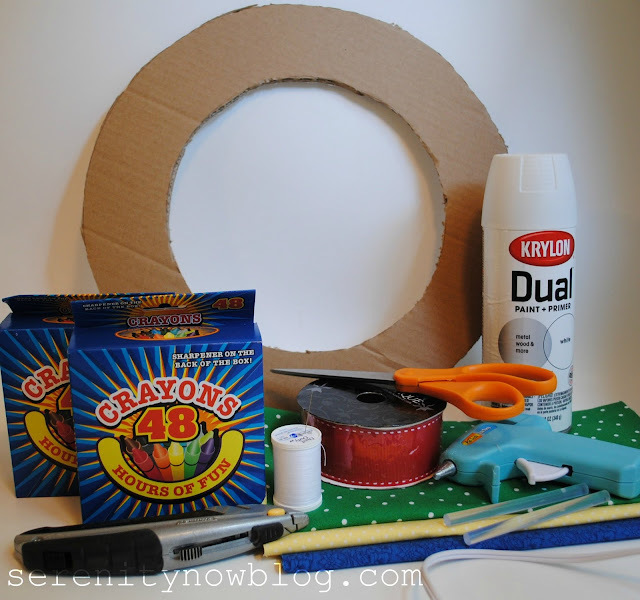 And I feel like I had a "duh" moment in never thinking of making a cardboard wreath form before! So much cheaper and it looks great! Very cute! Thanks for stopping by my blog! I, too, really like the same wrapper on the crayons! My kids have been in school for 2 weeks now, and it may be the saving of me! And them!! I love your wreath. So bright and colorful and frugal too! I think your white door is a perfect backdrop for such awesome colorful-ness. This is too darn cute! It will get any youngster into the mood for school that is for sure! This is so cute! The fabric flowers add a nice touch. 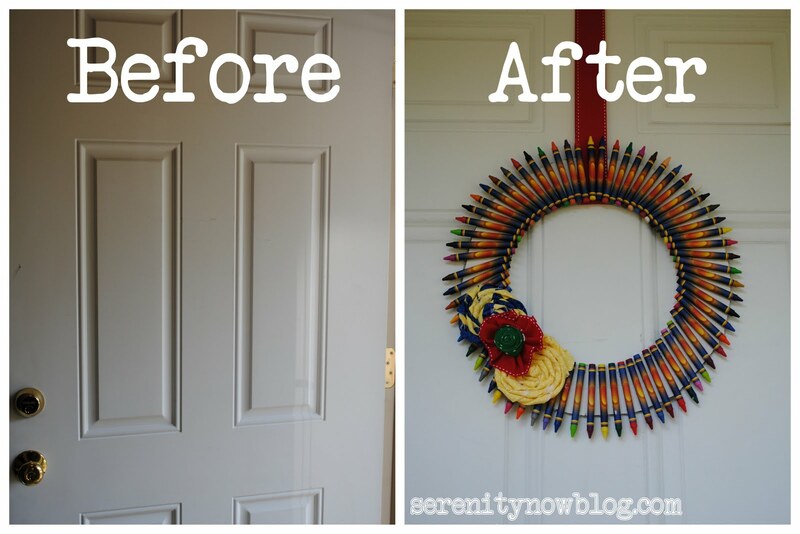 And you can't even see the cardboard form against your white door, so it just looks like a magical wreath of crayons! This is perfect for back-to-school season. I love that your crayon wrappers have their own cool design and no brand name. You were smart to use cardboard as your wreath form to save a few $$. I love this idea. I just found a box filled with new boxes of crayons. I could see this hanging in my daughters special art area. Best part is that I have all the stuff to make it today. Very cute! I love that you used cardboard for your wreath form! This is adorable, Amanda! I'll bet the girls were thrilled with it. When you no longer want it on the door, you could hang it in a playroom or in any space that's mostly dedicated to children. Or you could give it as a gift--I'll bet a preschool teacher would particularly love it! Love it!! I'm definitely sharing this one on FB. Also, that Staples commercial brings back so many memories. It was my dad's favorite commercial every time "back to school" time came around! Ha! This is adorable, Amanda! I know crayola ones would be pretty, but I kinda like that the wrappers on each crayon are the same. The rosettes are a fun touch! Now, where can I find that 'wet napkin craft' you've been talking about? Lol! Great job with the $store crayons, the wrappers are kinda cool! Cute, cute, cute! Come on over and see the Ferris Bueller chairs. This is so cute!! What a great idea! My kids are back in school and I am Soooo pumped! Now, I'm excited for my fall t.v. line ups to start!!! This might be one of my new favorites that you've made! How creative & the colors are so fun! 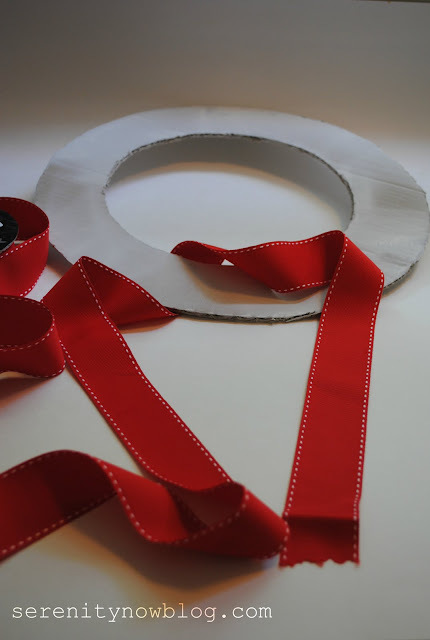 I might make one of these for my sister's classroom next year, the rosettes are the perfect finishing touch too. How has it held up in the heat? That is one of my favorite commercials. That dad just cracks me up. And the faces on those kids are priceless. 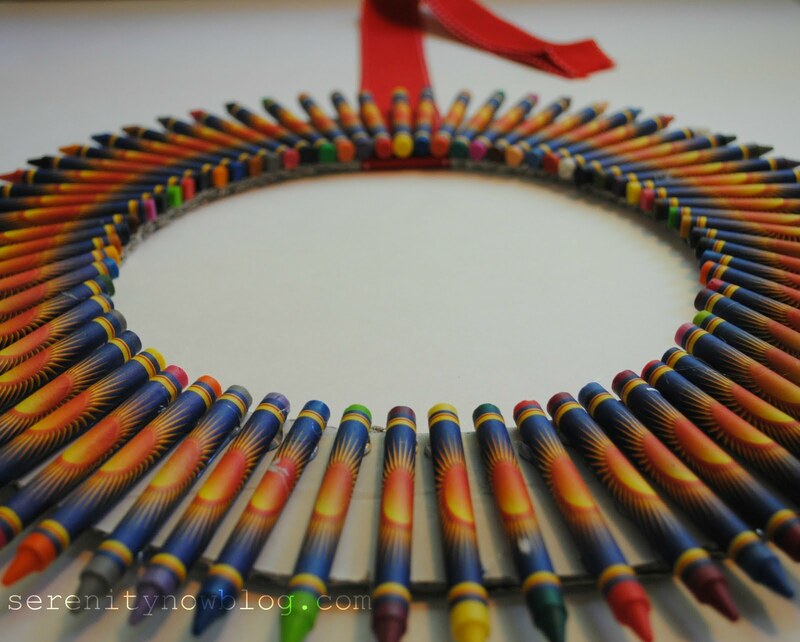 Great idea for using the crayons. A lot of bang for not a lot of bucks is always good in my book. I LOVE the crayon wreath on Pinterest...and yours turned out fantastic! Very cute! Just saw one last week with pencils I think. And apples on it. The crayon idea is really cute and colorful though! Great idea Amanda. i love that you used cardboard as the base- great idea! the wreath is really fun! Oh my!!! I love this! 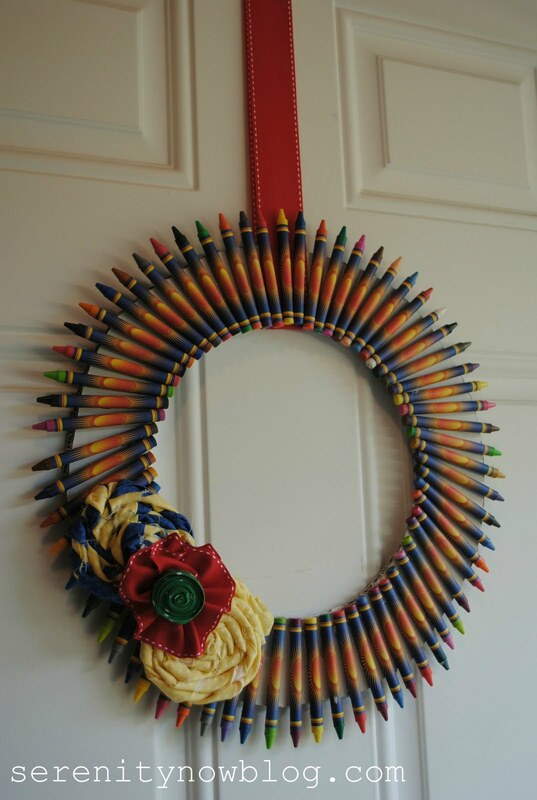 I love handmade wreaths but this is just awesome. 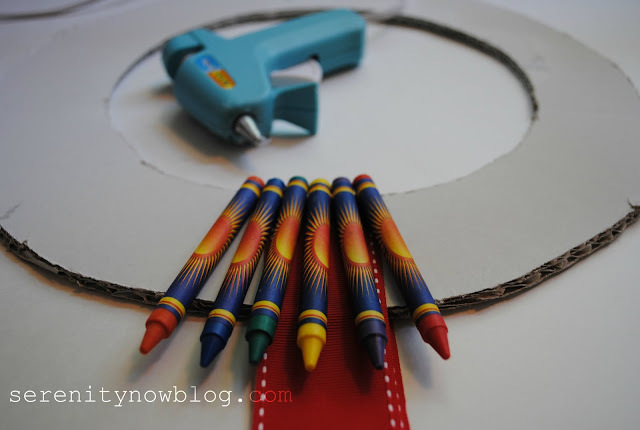 I can't wait to try and make this for my son's preschool teacher as a gift! Thanks for the ideas! What a cute project! I'll bet it was fun to make too. That would make a perfect decoration for our schoolroom!